The Swan Garage, of Longtown, Carlisle. Homepage. This page: An early invoice describes the work done to a vintage vehicle at a Carlisle garage. George Forster of The Swan Garage, 1924. Old invoices, such as this one, are a reminder of how garages used to be - able to handle most repairs on a variety of motor-cars, with repair and refurbishment being the solution, rather than simply replacing a broken part with new. Gloves were for sissies, and anyone with other than oil-caked hands throughout the day probably wasn't pulling their weight. 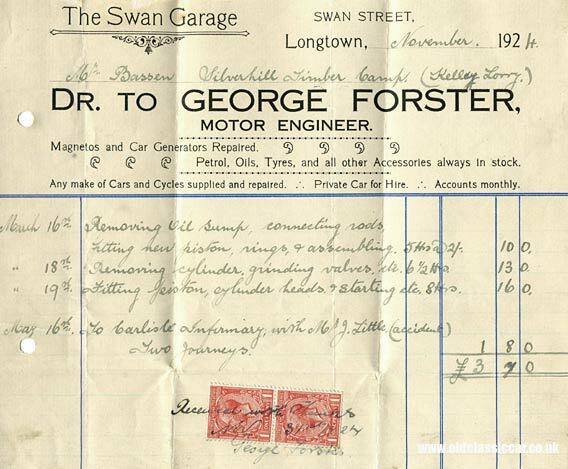 The Swan Garage was located on Swan Street, Longtown, in Carlisle, and the chief mechanic (and possibly the garage owner) was a Mr. George Forster, Motor Engineer. They could supply petrol (often known as motor spirit), oils, tyres and other motoring accessories. If your magneto had packed up, then they'd be able to repair it, likewise if your car's generator (dynamo) had given up the ghost, they'd be able to strip it and effect suitable repair(s). Removing oil sump, connecting rods, fitting new piston rings & assembling. (5 hours at 2/-). Removing cylinder, grinding valves etc (6.5 hours). Fitting piston, cylinder heads & starting etc (8 hours). The final entry is an odd one, and relates to driving someone to Carlisle Infirmary - requiring two journeys - following an accident of some kind. In addition to working on cars, Swan Garage also offered private cars for hire, so perhaps these journeys were in one of their hire cars. The identity of the vehicle being worked on, which belonged to Silverhill Timber Camp, isn't entirely clear, although there is a mention of a "Kelley" or "Kelly" lorry. There was a Kelly commercial vehicle produced in the USA between 1910 and 1912. Initially they had air-cooled engines, switching to water-cooled units when the firm became the Kelly-Springfield Motor Truck Co., of Springfield Ohio in 1912. They continued producing various lorries well into the late 1920s. Whether the lorry being worked on in Carlisle was of American build we'll probably never know. Does Swan Garage still survive on Swan Street? Visit the Motoring Collectables section for more old ephemera related to motoring in days gone by.